On October 26, audiences will be able to watch Dmitry Shostakovich's opera “The Nose,” as staged by the New York Metropolitan Opera with Brazilian baritone Paulo Szot. 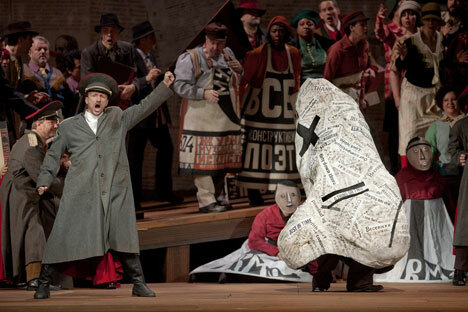 “The Nose” may seem like the least likely Gogol story to reach the opera stage, yet it has proved to be an enduring and poignant tragicomedy. The libretto was created by Dmitry Shostakovich almost a century after Gogol penned his work. In the story, a St. Petersburg bureaucrat wakes up one morning to discover that his nose has disappeared. He is shocked to learn that it has taken on a life of its own, grown to the size of an adult human, wears the coat of a high-ranking official, and wants nothing to do with its former owner. In the bizarre situation in which the protagonist Major Kovalev finds himself, only one thing is obvious: he needs to find his nose and secure it back in place as soon as possible. After all, he can't pursue career growth or have a successful marriage without it. The absurdity jumps well from the page to the stage, it turns out, and “The Nose" is yet another example of how great literature transforms into great music. The libretto, written by the avant-garde Shostakovich in the 20th century, closely follows Gogol’s fantastical storyline written in the 19th century. Both the writer and the composer created their versions of "The Nose" when they were young men. Gogol started his novel at the beginning of the 1830s, when he was in his early twenties; Shostakovich finished his opera in 1928, at the tender age of 22. Young Shostakovich's “Symphony No. 1” had already brought him accolades, even abroad, while Gogol had demonstrated his literary talent in the poetic and funny series “Evenings on a Farm Near Dikanka,” which is suffused with Ukrainian folklore. Their respective peers did not at first appreciate "The Nose” in either the 19th or 20th century. First published in 1836, the novel was repeatedly subjected to harsh criticism—even after Gogol changed several chapters. This all changed, however, when the great poet Alexander Pushkin praised the book and published it in his magazine, Sovremennik (The Contemporary). The tide began to turn and the novel was recognized for its originality and irony. It has been staged in theaters and filmed, as well as dissected to the smallest detail. Literary critics enthusiastically compare Gogol with Kafka. There is even a monument to Major Kovalev in the center of St. Petersburg. On Gogol's 200th birthday, the Nose Literary Prize was established in Russia by the Mikhail Prokhorov Foundation. The fate of Shostakovich's opera, first shown in 1930, was more tragic. In 1931, after 16 performances, it was removed from repertoire and banned for being too subversive. Finally, “The Nose” had a triumphant return to the Soviet stage in 1974, a year before Shostakovich died. Shostakovich commented on his oeuvre in Soviet newspapers: "The contrast between comic action and serious symphonic music is meant to create a basic theatrical effect, and it is all the more justified since Gogol himself sets the comic twists and turns of the plot to a deliberately serious tone..."
In his memoirs, Shostakovich said that he was not trying to be witty at all in his opera. In his view, Gogol's novel is a “horror story,” because a police chase cannot be funny. "The Nose" is really everywhere you go – the police, you can't take a step or throw a piece of paper without them, he said. Shostakovich added that he found nothing funny about the nose itself, as without a nose you're not a person, whereas without "you," it is fully capable of becoming not just a person, but an important dignitary. When he was working on "The Nose," Shostakovich met the pioneering director Vsevolod Meyerhold, and at his invitation moved from Leningrad to Moscow, where Shostakovich worked as head of music at Meyerhold's theater and wrote music for theatrical productions for a short time. His proximity to theater and the pervasion of Meyerhold's ideas probably influenced "The Nose." At the Metroloitan Opera on Oct. 26, the charismatic Brazilian baritone Paulo Szot plays the lead role in the production. The operatic singer and actor made his Met debut in that very same role in 2010, when the public and critics fell in love with him. Pavel Smelkov, from the Mariinsky Theatre in St. Petersburg, conducts at the Met.